Living Tradition of the Saints. since the second century after Christ. available here to support your journey. The Orthodox Church was formerly the Old Methodist Chapel. Father John serves the Divine Liturgy at Braithwaite Chapel. More photos on the Braithwaite Chapel page. FOR 2019 HOLY WEEK AND PASCHA CLICK HERE. Everyone is welcome to join us in worship. Our services are in English. 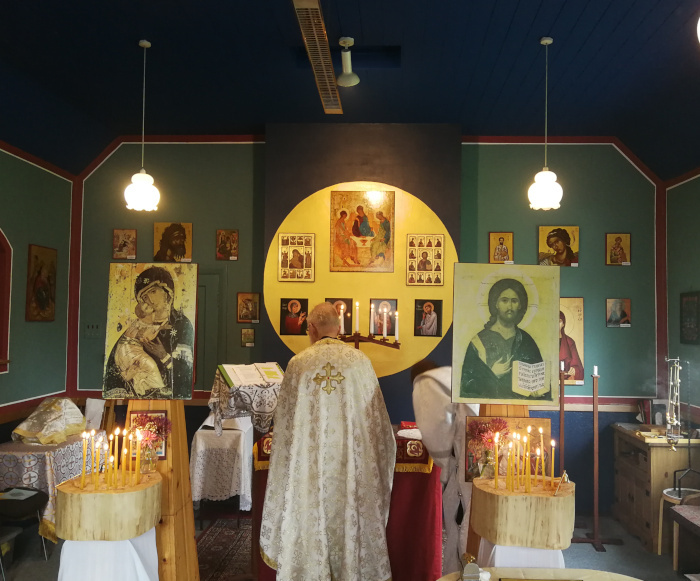 NOTE: There is no service on 28th April 2019 - Pascha Sunday, the Paschal Liturgy is on Saturday night, 27th April 2019. From about 9.30am on Sunday before the Divine Liturgy, a few of us gather to say the Jesus Prayer quietly, and then the Liturgy of Preparation is performed. Everyone is welcome, but please enter the Church in silence. A buffet meal is usually served after Sunday Divine Liturgy, and everyone is welcome to join us in the feast. Weekday Matins is only served when Fr John is able, and regretably this isn't predictable, however you can be assured that he and Jenny will be saying either Matins or 1st Hour. If you want to attend, please make sure that you have contacted Father by telephone to confirm. Some of Fr John’s sermons are on YouTube. 6th January 2018, The Feast of the Theophany. Brave parishoners race to rescue the cross. 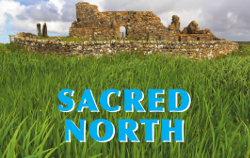 Our parish is quite young, having been formed a few years ago when Fr John and his wife Jenny moved to Keswick. Our parishioners come from many orthodox traditions, including Greek, Cypriot, Russian, Ukrainian, Romanian, as well as native British who have joined the orthodox communion. We do not represent any particular ethnicity but aim to present and support the ancient orthodox christian heritage for everyone. If you are Orthodox, you will fit right in; if you are interested in Orthodoxy or if you would just like to join us for a service to see what we do, you will be warmly welcomed. We are familiy-friendly too. 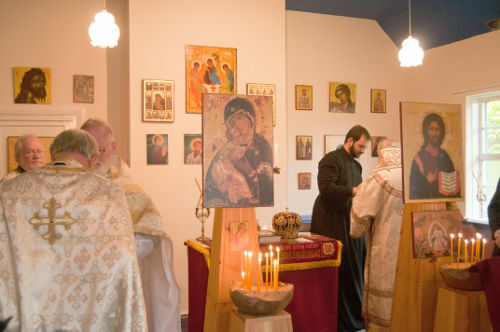 The Late Archbishop Gabriel of Comana of Blessed Memory(behind the Icon of our Lord), his Heirodeacon Father Athanaz (in black cassock), our priests Fathers John and Anthony (back to us), with visiting priest Father Christopher Wallace prepare before the Hierarchical Divine Liturgy, 6th May, 2012.